Week Forty-Two: Did Someone Say Cheese? There’s a reason why we’ve avoided visiting India’s main cities, completely bypassing the likes of the Taj Mahal, Ganges and other Indian must-sees. They’re dreadful for cycling. At least we think so. The city of Pondicherry, our first real city experience, was an absolute nightmare after so long in rural India. I was consumed with road rage, which so often reared its ugly head on my London commute. At one point, I shuck my fist at a terrible driver in the ‘why I oughta’ kind of way. Except those weren’t the words that came out of my mouth. Even Dan suffered with a touch of road rage, which is very unlike him. He usually copes well in those situations. That’s when you know it’s bad: when Dan flips his lid. I just read this blog post out to Dan, which I do each week, and he said I have to admit to yelling ‘no’ in a motorbiker’s face for pulling out on us. Holding my hand up to a rickshaw driver, like a demented lollypop lady. And screaming in the middle of traffic, like you’d scream if you were alone on a Swiss mountain. Yup – I definitely don’t cope well in traffic. Also, people in cities are so rude. Within the first ten minutes of arriving at our hotel, the hotel manager point-blank refused to offer up any place to store the bikes, which has never happened. He then ignored Dan mid-check-in and started serving someone else. Meanwhile, a guy outside yelled at me to move the bikes because he wanted to get out of a parallel park. I’m sorry, mate, but the gap you had, a bus could have pulled out. He was clearly being a douche, as when I did move the bikes onto the pavement, three motorbikers took our place and he didn’t say boo to them. If the last three months had been anything like the first hour or so in Pondicherry, we’d of left India a long time ago. Cities really are a different experience; it’s like nothing we’ve experienced anywhere else in India. Things did pick up after that. Well, the hotel guy was still super rude, but he was rude to every guest we saw him interact with, so we didn’t take it personally. What brought a smile to our faces was the fact that we were back by the seaside, had three days off (we smashed the kms to gain that day back), and found proper cheese and baguette – the only reason we stopped in Pondicherry really. We also found some decent red wine. Sula is actually an Indian wine, produced at a vineyard in the northwest of the country. I bet you’re wondering why Pondicherry has such good cheese and bread? The city has a rather interesting history. Once colonised by the French, the French East India Company established Pondicherry as their headquarters in 1674 – and brought with them all their goodies. Yet between 1742 and 1814, Pondicherry changed hands frequently during the multiple wars between the French and English. When the British gained full control of India in 1858, they allowed the French to keep their Indian settlements – Pondicherry being one of them. It remained this way until India became independent in 1947. Despite the French moving out, there’s still plenty of French influence in Pondicherry. We assume more for tourism nowadays. Architecture in the French Quarter is very European, there are quaint cafes on every corners selling proper coffee and croissants – make sure you ask for no milk or sugar, if that’s how you take it – and of course, the cheese and bakeries. There’s actually two cheese farms in the area, which you can visit – La Ferme Cheese and Auroville . We treated ourselves to a little picnic in the park, another Euro-styled place, which would rival a picnic we would prepare at home. We picked up an Auroville mature cheddar and an imported French blue from Nilgiri’s Supermarket. I call it a treat, as the two cheeses set us back £8.47. But they were so worth it. We topped up our picnic basket with some Kettle Chips – salt and vinegar, naturally – and a fresh baguette from the bakery. Oh and butter! Mustn’t forget the block of butter that we demolished. It was fabulous. 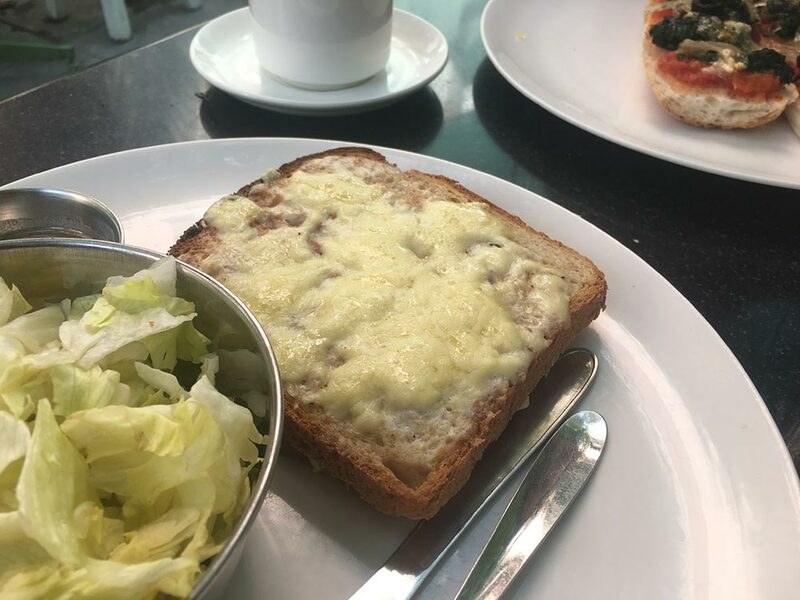 As if that wasn’t enough cheese for two people to scoff, we treated ourselves again to a brunch at Cafe des Arts. It was very French, as you can imagine. Dan got croque monsieur and I got a blue cheese and veg baguette. We miss European food. Here’s something for ya – since Hindus don’t eat beef, and they make up most of the population, you never see beef on the menu here in India. McDonald’s has clocked onto this and adapted to the Indian market by only selling chicken burgers. They’ve also recreated the Big Mac as a Chicken Big Mac, aka Chicken Maharaja Mac. Let me tell ya, it’s no Big Mac. There’s no classic burger sauce and it’s spicy. Also, it’s chicken! 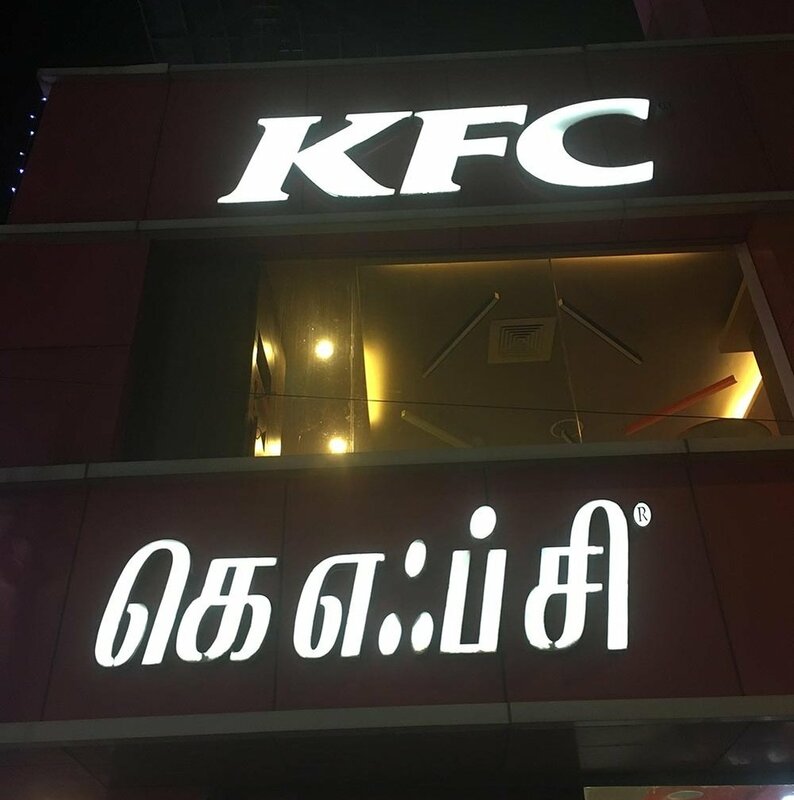 KFC in Hindi (we assume). It’s fascinating to see famous logos translated into local languages, as they are so often still recognisable (maybe not this one). There were so many examples of this in Russia. Before we left Pondicherry, we also had one McDonald’s, one Domino’s (more cheese!) and two KFCs. Piggies. Then we headed up the coast for the final stretch, where we spent one night in Mahabalipuram. This was a lovely little fishing town with a handful of cafes and bar – still with French influence. In hindsight we would have left Pondicherry a day early and spent an extra night here, had we of known how lovely it was. But now we were running out of time, Chennai, our last stop, was calling. So on we went. Upon reaching Chennai we dropped our bikes in for a service and finally found a restaurant that had a working tandoor, meaning NAAN BREAD. 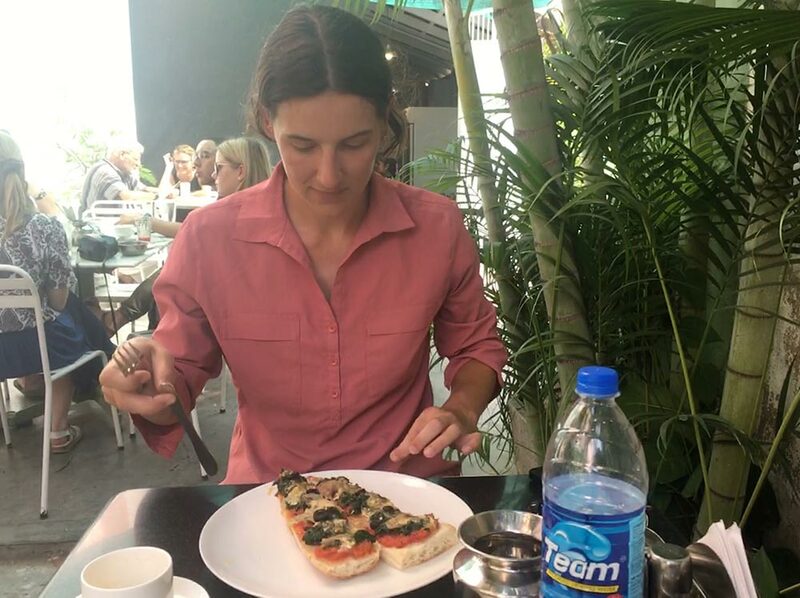 You wouldn’t believe how hard it is to find naan bread in India. Looking ahead we have a long list of stuff to do before we fly to Kenya next week. One of them being a 28 hour train to Mumbai for our flight outta here. Where has the last 3 months gone?